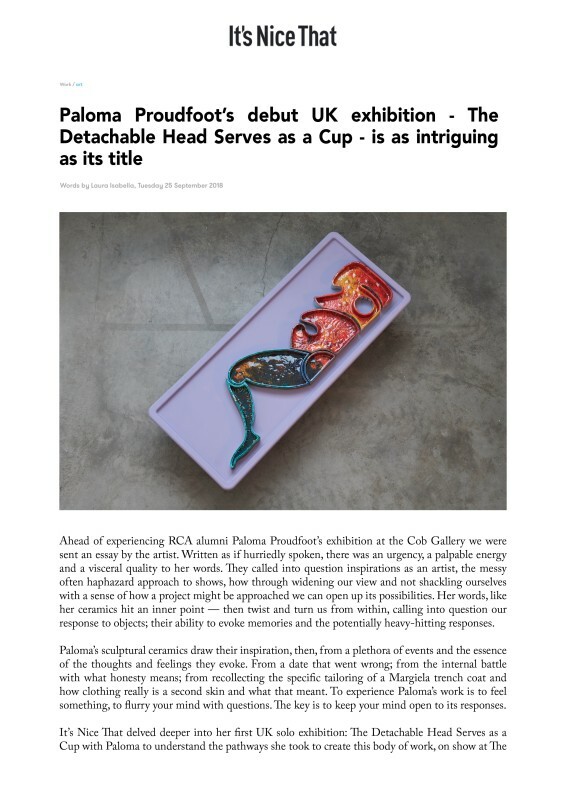 Ahead of experiencing RCA alumni Paloma Proudfoot's exhibition at the Cob Gallery we were sent an essay by the artist. Written as if hurriedly spoken, there was an urgency, a palpable energy and a visceral quality to her words. They called into question inspirations as an artist, the messy often haphazard approach to shows, how through widening our view and not shackling ourselves with a sense of how a project might be approached we can open up its possibilities. Her words, like her ceramics hit an inner point - then twist and turn us from within, calling into question our response to objects; their ability to evoke memories and the potentially heavy-hitting responses. Paloma's sculptural ceramics draw their inspiration, then, from a plethora of events and the essence of the thoughts and feelings they evoke. From a date that went wrong; from the internal battle with what honesty means; from recollecting the specific tailoring of a Margiela trench coat and how clothing really is a second skin and what that meant. To experience Paloma's work is to feel something, to flurry your mind with questions. The key is to keep your mind open to its responses.